Instagram is great for sharing tons of photos with your friends when you're on the go, but some people will use almost any excuse to post photos and engage with other users. 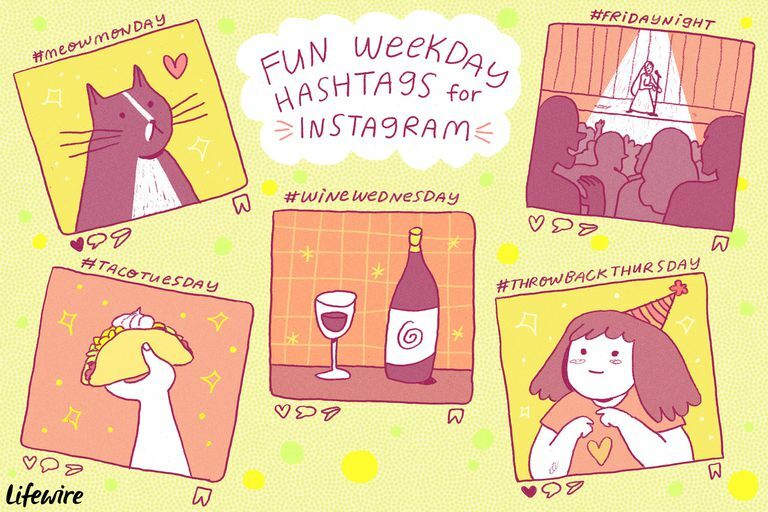 Trendy Instagram hashtags meant to be used on specific days of the week like Thursday, Friday, Saturday, Sunday and the rest of the week are a great way to do that. Hashtags that are geared toward a specific day of the week typically have a certain theme attached to them, which is why they're especially popular these days. #ThrowbackThursday (or #TBT), for example, encourages Instagram users to post an old photo on Thursdays. Throwback Thursday is arguably the weekday hashtag trend that's embraced the most by social media enthusiasts around the world, but if you need an excuse to post something on Monday, Saturday or whenever, then you'll have to look for another hashtag to use. There are endless weekday hashtag trends for every day of the week, and they just keep growing. Here are some great weekday hashtags you can start using right now. Just pick a day of the week, find a photo with that theme, post it with the hashtag and you're done! Ah, Sunday! Time to relax a little and maybe even prepare for the new week ahead. #SelfieSunday: Need an excuse to post a selfie? Of course, you can post selfies any day of the week, but on Sundays, you have one extra reason to do so because of this hashtag. #SundayFunday: There's no shame in showing off all the fun you've been having all weekend. This hashtag encourages you to share whatever fun activity you might be doing before heading back to work or school for another week. #LazySunday: For those who need balance between a hectic or fun-filled Saturday and one more day to fully let loose and chill out, there's #LazySunday. Show your friends and followers what you love to do during your downtime. #SinfulSunday: Go ahead and post a NSFW photo of yourself if you're fine with sharing it with the world (and the fact that once it's online, it's online for good). If not, there's no harm in browsing through this hashtag to see what's there, in a NSFW-friendly environment of course. Mondays are hard. Luckily, there are lots of fun hashtags to distract you from the start of a new workweek. #ManCrushMonday or #MCM: Monday is a special day for all the female users on Instagram because they're encouraged to a post a photo of any guy they think is attractive. Unsurprisingly, this hashtag sees a lot of photos of male celebrities, models, and athletes. #MondayMotivation: This is a great hashtag for posting photos of motivational quotes to inspire your friends (and get inspired yourself) when you're not quite feeling it upon getting back to work after the weekend. #MondayBlues: Opposite of #MondayMotivation is #MondayBlues where instead of everyone inspiring each other, everyone just empathizes with how difficult it is to get back to the daily grind. #MeowMonday: Cat owners and cat lovers, Monday is for you. Share a photo of your cat or even just a funny cat meme on the internet. After all, the internet can never have too many cats. On Tuesdays, Instagram users can get creative with a variety of different themes to choose from. #TransformationTuesday: Lots of people post photos of themselves when they were younger and make a side-by-side comparison to show what they look like on the current day. They also often post their fitness results or they just share some other story about how they've grown and changed over time. #TuesdayTip: Friends and followers can always appreciate a little advice from someone who has the knowledge and experience related to something important. Share a tip that you think might benefit them on this day. #TacoTuesday: Is there anyone in this world who actually doesn't like tacos? Tuesday is taco night, so share your delicious creations online to make everyone's mouths water. #TongueOutTuesday: If you're a dog owner, you can snap a photo of your pup when he or she has his or her tongue hanging out. There's nothing more adorable than a dog who's basically smiling for the camera! It's the middle of the week, so you'll need some cool hashtags to get you through until Friday. #WomanCrushMonday or #WCW: This is exactly like #ManCrushMonday, except obviously it involves photos of women instead of men. Post a photo of the gal you have a crush on and tag it with this on Wednesdays. #HumpDay: What are you doing to keep you going strong in the middle of the week? Share it on Instagram and other social media platforms to help friends out who could use a bit of a pick-me-up. #WednesdayWisdom: You can give out tips on Tuesday, but save your true nuggets of wisdom for Wednesday. And write a lengthy Instagram caption if you need to! #WineWednesday: Hump day is also a good excuse to break out the wine. Share your classy wine photos with this hashtag. Oh boy, everyone loves to share on Thursdays! Thursday might just be the most active day on social media platforms like Instagram. #ThrowbackThursday or #TBT: This hashtag is all about posting anything that feels retro and nostalgic. In fact, it's so popular, you'll often see it used on other popular social networks, like Twitter and Facebook. #ThursdayThoughts: Got something you need to get off your chest? Vent or share your thoughts on absolutely anything by posting with this hashtag. #ThankfulThursday: Hey, you're almost through the week! This is a great time to reflect on what you're grateful for. It may just inspire others to be grateful too. #ThirstyThursday: This one can be taken literally (as in thirsty for a drink) or metaphorically for anything you really desire. Be careful since some users tend to post NSFW content under this hashtag! It's the end of the week, no need to get up early the next morning, so it's time to celebrate! #FlashbackFriday or #FBF: Strangely enough, Friday even has its own version of Throwback Thursday. It has the exact same theme as #ThrowbackThursday (posting nostalgic content) but for those who missed the chance to do so Thursday. #FlashbackFriday sort of just gives them an extra day to do it. #FridayReads: For those who prefer to kick back with a good back after a long week rather than go out and party, there's the #FridayReads hashtag, which encourages you to share what you're reading. #FridayNight: If you're one of those people who enjoy living it up at the end of the week and staying out late, share your Friday night fun with this hashtag. #FridayFunday: Similar to #FridayNight, go ahead and use this hashtag to brag about how much fun you're having on Friday. Woohoo, it's the weekend again! Although not as many people are online on Saturday because they're out and about doing things, it's still a great day to post. #SaturdayNight: #FridayNight is another hashtag that extends over to the next day. Everyone knows that Saturday night is a big party night too, so it's only natural to want to share all the fun. #SexySaturday: Dressing up to go out this Saturday? Snap a photo and share your style with your friends. #Caturday: Yup, cats again. If you can't get enough cats for #MeowMonday, well, there's always Caturday! #SaturdayShenanigans: Saturday is a day to be busy running errands and doing fun activities with the family or your friends. Use this hashtag to let everyone know what you're up to this Saturday.